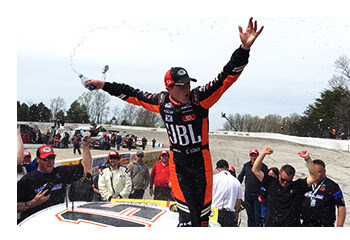 Concord, NC (April 23, 2018) – After so many near misses seventeen year-old Christian Eckes finally got the ‘monkey off his back’, winning a thriller Sunday afternoon at Salem Speedway. Eckes’ first career victory is Venturini Motorsports’ second on the young season and 46th all-time in ARCA competition. Eckes, driving the No.15 JBL Audio sponsored Toyota for Venturini Motorsports, held off a non-stop charge from teammate and pole sitter Chandler Smith for the last 30-laps bringing a packed house to their feet for a dramatic finish as the two drivers circled the half-mile bullring in search for their first victory. With the white flag in the air, Smith followed in the immediate tire tracks of Eckes as both charged into turn one inches apart. Then, in an instant, Smith cut down a right-front tire as his No. 20 Smith General Contacting Toyota slid up the banking and smashed hard into the wall while Eckes sailed off toward the checkered flag. Smith was credited with a 10th place finish after the accident. The class of the field throughout the day, Eckes and Smith combined to lead 189 of 200 laps on the day. Smith, 15, earned his second consecutive General Tire Pole Award on Saturday and led a race high of 117-laps in just his second series start. Eckes traded the top spot with Smith a half of dozen times before coming out on top led 72-laps on the day. Natalie Decker, driver of the No.25 N29 Capital Partners Toyota finished a disappointing 17th in her first trip to Salem. Decker, showing speed, drove her way up to fifth place before being turned in turn-4 and taking heavy right side damage and ending her chances. Off to a torrid pace, Venturini Motorsports has won two of the first three races on the season (Daytona and Salem) with Michael Self and Christian Eckes and has claimed three consecutive General Tire Pole Awards behind the efforts of Chandler Smith (Nashville and Salem) and Natalie Decker (Daytona). The next event for the ARCA Racing Series is the General Tire 200 at Talladega Superspeedway on Friday afternoon, April 27, live on FS1.